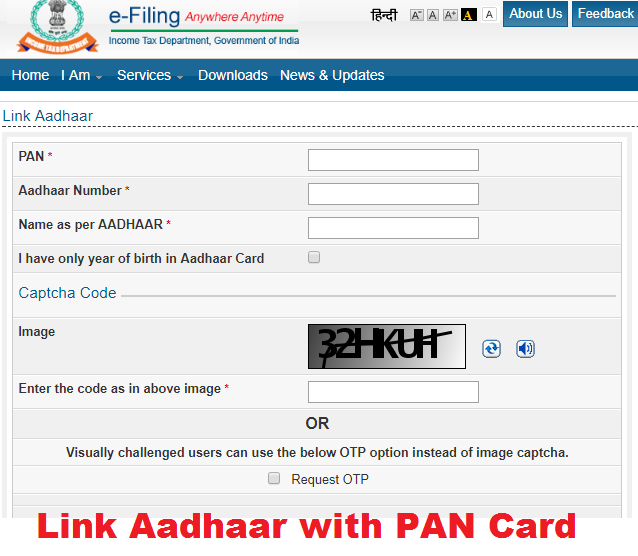 How to Link Aadhaar with PAN Card - Link TODAY!!!! Link Aadhaar with PAN Card - NOW!!! Hello Friends, Looking For How to Link Aadhaar with PAN Card ? As now its mandatory to link your Adhar card with PAN card for your Income tax returns and also now it has been compulsory for bank accounts that your both cards are linked to each other. All the new bank accounts will be opened only if you have linked your PAN and Aadhaar both with each other. So if you havent done it yet checkout the below article and link it now. It hardly takes 5-10 minutes process. For any queries or questions feel free to ask below in comments. You need to submit some data of your Aadhar card and PAN card which will be needed to link both. All you have to do is visit the official website of Income tax department and from there you will get to the link which will show the image link form as shown above. And follow the steps mentioned below. You need submit your PAN card number , Aadhar card number wherever asked. After that, need to enter the Captcha Code or handicapped people can ask for OTP on their mobile phones you will get a code you need to enter there. And Click on "LINK AADHAR" and it linking would be done. You can Link Aadhaar with PAN Card from the link provided below. You also buy this book from our website you will get it in the left side bar column from amazon you can have it or can also study from the PDF. Keep following us for more Free E-Books for various exams we would be keep giving you the free PDF for the books. Follow us on Facebook. Feel free to ask questions regarding Link Aadhaar with PAN Card . This was all aboutLink Aadhaar with PAN Card . Hope you have downloaded the books required for the exams. For any questions feel free to ask below in comments. Also keep following us on Facebook for more updates or can subscribe us on mail.